Grace was one of the big guns of the Comics’ Greatest World. 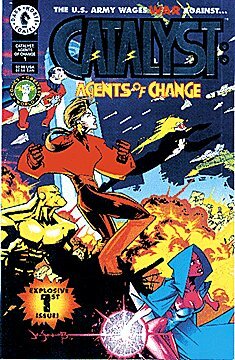 This was a new super-hero universe launched by Dark Horse Comics in 1993. The CGW had quite a few interesting bits, including the charismatic, smart and powerful Grace and the political storylines around her. Unfortunately, it largely went under a few years later during the big comic book market crash. Bits and bobs of the CGW tenaciously held on or resurfaced later, as the less bombastic “Dark Horse Heroes” imprint. I don’t think there has been a digital reissue of most Grace material, though. These notes precede her return of sorts in Catalyst Comix by many years. Other Aliases: She’s sometimes indexed as “Amazing Grace”. Group Affiliation: Leader of the Agents of Change. Height: 6’7” Weight: 164 lbs. Grace is one of the strongest (about “Class 85” by our reckoning) and most durable beings in her world. She can fly in space at tremendous speed, and may open black, diamond-shaped spatial warps. She’s also brilliant, competent and charismatic. Curiously, it is her ability to teleport that scares most people – she can be everywhere. These people would be even more scared if they knew of her superhuman senses. 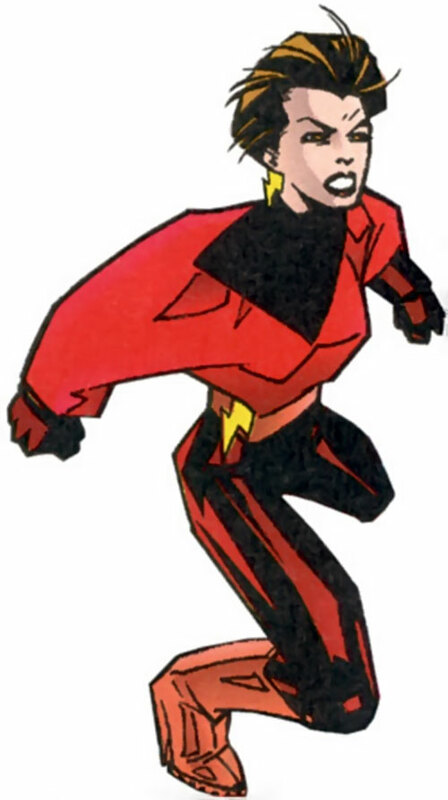 When Grace gets attacked and none of her agents are present or able to deal with the threat, she’ll use her teleportation diamonds (in DC Heroes RPG terms, Warp). They appear but inches in front of the (often rapidly moving) target. Dodging them or stopping in time is normally unfeasible. Having a stampeding buffalo herd pass over a stationary opponent (appearing three meters before him and then disappearing three meters after him). Sending opponents to the Rockies. Inside a little hollow space in a mountain (in DC Heroes terms, it takes an EV of at least 16 to get out). Into orbit (usual rules for exposure to vacuum). A few hundred meters beneath the sea (see the usual rules for drowning if applicable). At the bottom of the Marianna trench. That’s 36,000 feet deep with a pressure of eight tons per square inch. Consider this is a Physical attack with an EV of 17, acting every Phase – it was sufficient to crush a Destroyer of the Reaver Swarm within Phases). Within a volcano (EV is at least 10 and up to 16, depending on temperature, pressure, etc.). She once threatened to send an opponent to Saturn. Since empty threats are very unlikely from Grace, I assumed she could actually do it. If she has the Initiative she may perform a Warp dodge (Warping a charging opponent in front of her and have him appear behind her). If she feels like it and gains Initiative on the next round, this kind of tactic can easily allow her to get into position for a Blindside attack. She can Warp air-to-air missiles in mid-flight (AV 06, EV 13) and deliver them somewhere else in the world with great accuracy. She can Warp you in front of a bullet train (EV is probably 18 or 20, I guess). She can Warp herself for very short distances in quick succession, giving the impression to be in six places at once and leading opponents to shoot phantoms. She can use Warps to teleport her agents all around the place to enhance their tactical skill. She can ask Warmaker to throw a punch or a high-velocity anti-tank rocket in a diamond before him, and have the other part of the Warp open one inch in front of your face. She can “parry” the Man from the Vortex’s most powerful blast with a diamond and hit him with his own attack in the back through another diamond. She can do every dirty Dimension Door trick you can think of, and then some. Not that only things that enter her diamonds can be Warped – although they often enter it without meaning to, as mentioned above. Stuff that is just on the other side, like seawater, does not seem to get in. Grace once controlled pressure in an enclosed space through a Warp, but that’s the only instance. Objects that are not moving cannot be Warped. Of course, not moving and blasting at her is a poor tactic – she’ll just open a diamond in front of you and all of your shot will end up somewhere in the Gobi desert or in the back of your buddies. 25 years ago, Grace appeared in a quiet Californian northwestern town. “Amazing” Grace always had the right idea, always took the right decisions. Her immense might allowed her do to great things for the town. She was soon elected as Mayor. Under her social and political guidance, the town now called by all “Golden City” became the showcase for the best in humankind . There was essentially no crime, no hunger, no pollution, no poverty, no worries. It was an Utopia transformed by Grace’s extraordinary’s vision. Grace became the undisputed matriarch of the town. Many considered her as something much closer to a tutelary god than a mayor. Few people were worried about her power being near-absolute. It was enforced through popular acclaim, not force – despite the fact that Grace was one of the mightiest known beings on the continent. As everything she did was right, and her charisma was unmatched, people got used not to question her decisions and authority. Golden City grew to become a major metropolis. It also saw the rise of several superheroes, such as American icon Titan, and teenage heartthrob Rebel. These two, along with the healer Rhapsody, out-of-town talents Ruby and Mecha, and Grace’s right-hand man Madison were Grace’s private guard and cadre of agents. Grace’s agenda, of course, was not limited to this. As always when highly prosperous areas coexist with poorer, less peaceful ones, the citizens of Golden City came to resent Washington’s interference. Grace subtly encouraged this. She even engineered an incident where a renegade SOCOM super soldier, Warmaker, escaped from the Golden City prison (one of the only prison in the US that could contain super criminals) and rampaged through the city. This brought anti-Federal sentiments at an all-time high. However it also caused the accidental, unplanned death of the hugely popular Rhapsody. That was the event Grace used as justification for seceding from the United States. The newly created city-state shut its doors, leading to the creation of a huge tent city of would-be immigrants outside it. The US military took cautious action against the city. These operations were mostly intended to locate and eliminate Grace, since an actual invasion made little sense. But Grace went on the offensive. She allowed a missile to slip past the city’s defences and hit a street where a CNN crew conveniently happened to be. The US Army launched a quick, last-chance offensive using a powerful armoured suit called Grenade to locate and kill Grace. But that risky attempt blew in their face when Grace’s agents (called the Agents of change, or sometimes Catalyst) caught the powerful fighter in the open fields outside Golden City. Grace forced the suit to self destroy using a FAE charge . The general public, watching something that looked like a nuclear explosion on American soil, had the government pull back from Golden City. A deal was reached between Grace and the government. The more generous parts of the agreements were finalised when Titan, an all-American hero, was given back to the US. He would work as an agent for the National Security Council, instead of continuing to work for Grace. Those events occurred roughly at the same time a band of alien warriors attacked and destroyed the US’ most sensitive military base. It was built in Nevada, over an abandoned alien facility. This raid awakened an alien demigod that soon started drawing more attacks from deep space. The US government tried to get rid of two problems by having Grace investigate the being from the Vortex. But Grace decided after that little fact-finding mission she’s rather trust the alien. This resparked hostilities between the two countries. The next crisis came when Titan’s sanity started to unravel. His will had always beenstrong, but he started imposing that will over everything and make everything “right”. He acted increasingly rashly, until the government understood they couldn’t control their pet hero anymore. Meanwhile, his might steadily increased as his sanity went away. The US government asked Grace to solve the problem, and she saw a golden occasion to have Washington in her debt. Howbeit, she had underestimated the rate at which Titan’s power grew. She soon had to fight a Superman-class threat. At the end of a long, hard fight that badly damaged Golden City, Grace managed to reel Titan into the Vortex. There, she had him attack the alien scientist’s lab. And though she hadn’t planned in, the mystic called King Tiger came in. King Tiger shot Titan dead with an arrow. The mighty but demented hero rose again out of sheer might and tenacity, but the Man from the Vortex finished him. Grace had to rest and recover for days. She was too drained to teleport or fly over long distances. 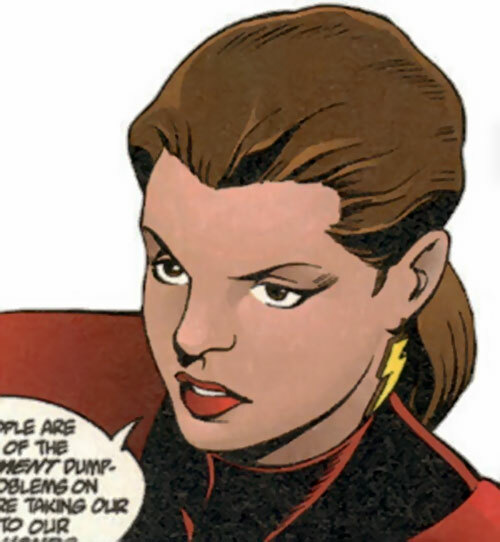 A subsequent crisis at the Vortex (followed by the arrival of Nexus, who had come to execute Vortex) made her leave of absence even longer. Still, her courage during those crises was enough to impress the Man from the Vortex, who appointed her keeper of his science complex. 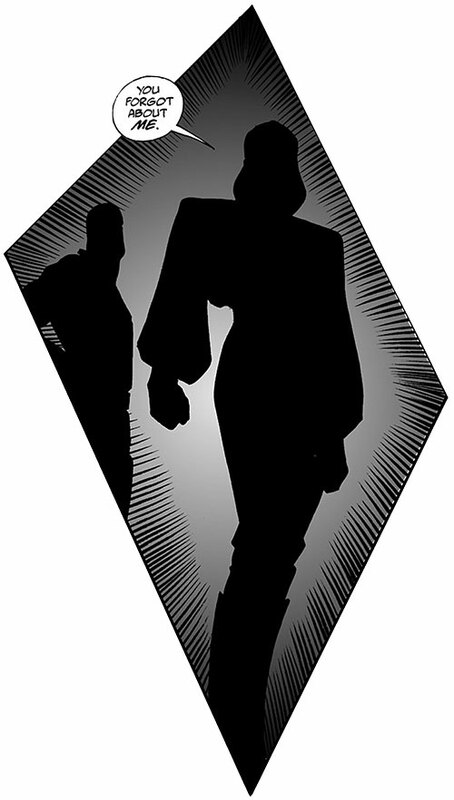 While she was away, the man known as Law, the first to have been in contact with the Vortex phenomenon, came to Golden City. He was carrying what he claimed was Grace’s comatose form, which was almost immediately shot dead by a convenient sniper. The sniper, in turn, was soon conveniently killed. Law told an epic story about him fighting along with Grace in her last fight, being her last confident. He also implied that he had been her lover. As the self-described last recipient of Grace’s mandate, he took power in Golden City. Law proved to be a thoroughly ruthless, brutal and intelligent tyrant. He eliminated by force and guile all opposition to his reign. In particular, he dismantled the Agents of change. But Grace came back with a plan to regain Golden City. However, this is exactly where most publication for Dark Horse Heroes books was cut short. Instead of the original story line, we saw Law getting killed by a Predator, leaving Grace to peacefully retake her city. Grace is a brown-haired, towering woman in her 30s. She wears a featureless black jumpsuit leaving only her head bare. 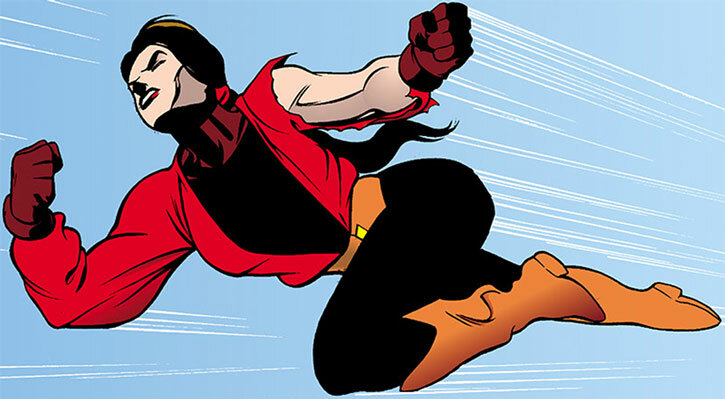 Above it are red boots, a broad red belt and a kind of red, broad sleeved tunic. 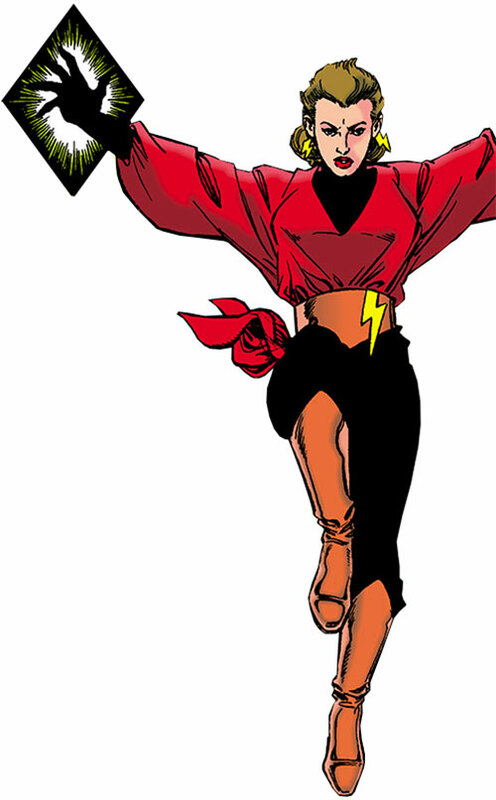 She wears a yellow lightning bolt symbol on her belt, and also as earrings. In a fight, she tends to throw the belt and shirt into a Warp before engaging her enemy. Is quite manipulative. Especially when it comes to using the media to her advantage. Does not tell anyone anything about what’s going on (except for Madison). Does not believe in democracy as a viable political tool – at least not while there’s a state of crisis. Mostly, she’s a highly intelligent leader and politician. But she wastes little time on the feelings of others and the moral implications of what she does. To her, the ends clearly justify the means. She’s also something of a control freak, and like to plan, double-plan and triple-plan for any eventuality. Most people will blindly trust her, and assume that *any* crisis will be somehow handled by Grace and her agents. They treat her pretty much like a goddess. Grace herself is supremely confident in her abilities. She’s also certain that she’s working for the common good. Thus, she easily gets authoritarian or overconfident. She can’t stand being talked down to, either. Grace doesn’t like to get into physical combat. Thus, she’ll respond first through her agents, then by warping opponents far, far away. But once she starts fighting, she’s almost unstoppable and quite resourceful. Her willpower is also impressive. Grace will stop at nothing to reach her goals, going above and beyond the point where most people would have died thrice over. She’s also used to making snap decisions without any explanation. She sometimes resorts to dry sarcasm. Life sense allows for locating persons whose energy signature has been memorized (+1) and for rough comparison of energy signatures (+1). Warp can only affect objects or beings that physically enter it (-1). Area Knowledge (Golden City, Earth), Credentials (Golden City, High), Expansive H.Q., Leadership, Popularity (Golden City), Scholar (government). Agents of Change (High), Golden City (High), White House (Low), Pentagon (Low), Vortex (Low). Authority Figure, SIA toward her vision for Golden City. Source of Character: Dark Horse’s “Comics’ Greatest World”.